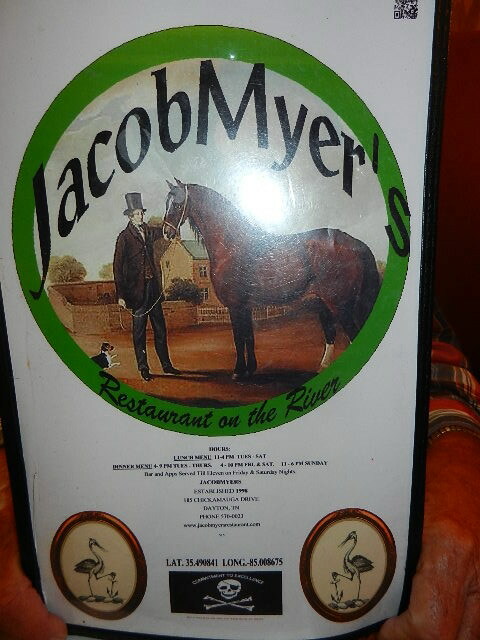 Dayton is a nice little town to visit and while you are there check out Jacob Myers Restaurant on the River. I found this restaurant through a search and I’ve heard good things about it from many people. Needless to say we had to check it out. My husband and I went a week ago and arrived at 4:00 pm on the button. They were so not-busy it wasn’t funny. There was only one other table (two people) in the dining area where we were seated and one table at an adjoining dining area. Not only were we seated instantly, we got our sodas within a minute after ordering them. Our sever was very attentive and he had a good personality and was very helpful. My husband ordered the fried shrimp dinner which comes with fries, hush puppies and slaw. It did come with far too many fries but only six shrimp. He also said the fries could have been a little hotter but he still ate them. The slaw had what my husband described as ‘a kick’ to it. He thinks they had a little horseradish in it, which he enjoyed. I had the sirloin steak, baked potato and a small dinner salad. Their entrées comes with two sides and a dinner role. I asked for French dressing, but they don’t have it, so I had to take honey mustard which was very good. I ordered my steak medium rare and that was exactly how it was served. I had asked about spices and was told it would just have salt and pepper, which was true. It did have enough pepper to last me a week. Next time I would ask them to cut back on the pepper. I did ask about what was in the display cabinet of goodies near the front door – and was told they have several kinds of cheesecake and a variety of cookies plus some type of pudding cake. Since nothing sounded good to me, and I was full, I took a pass on the sweets. Our server did bring us each a fresh soda before we finished what we had. For me that is a waste since one is far more than enough. I would prefer they ask if I would like a refill. My only other complaint had nothing to do with the restaurant, the food or the service. It was about the other two customers in our section. There was man and a younger girl who I assume was his daughter. From the second they sat down until the second they left he was on the phone. Not only was he on the phone, he talked at full volume. We could hear every word and to me that is very annoying. I don’t care about anyone’s business but my own when I’m out to dinner. It got to the point that I was going to ask our server to talk to him. He did finally put the phone away, but only because they were leaving. He had no common sense or common courtesy but that’s not the restaurant’s fault. 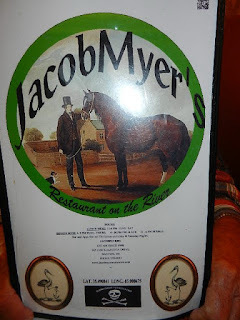 Will we go back to Jacob Myers Restaurant on the River? Most certainly. If I have the sirloin steak again I would ask that they hold the pepper. If you aren't sure what the Scopes Monkey Trial was you can read about it here. For more information on Jacob Myers Restaurant on the River read about it here.